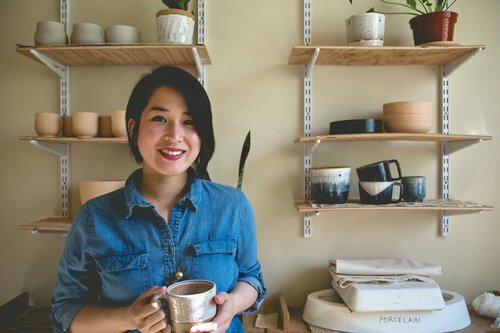 Stephanie Cao is a small batch potter who creates hand thrown pieces out of her studio in the Ballard neighborhood of Seattle, WA. She has loved working with clay since she was a child and took her first pottery class in 2011 at UMass Amherst, where she was studying Architecture & Design. Her work is inspired by her home in New England, as well as her current home in the Pacific Northwest. When she is not at the wheel, Steph enjoys hanging with her dog Ken, doing yoga, and working with the lovely ladies of Camelion Design. See something on her website that you want? She will gladly do custom orders!